With The Honey Pine Arched Mission Trundle Storage Bed, You Wont Have To Sacrifice Trundle Sleep Space For Spare Storage Room - This Innovative Trundle Unit Neatly Fits A Mattress(Not Included) Above Its Built-In Storage Drawers. Crafted With Sturdy Solid Hardwood, This Super-Practical Bed Is Classically Designed With An Arched, Mission-Inspired Slatted Headboard And Foot-board, Square Posts, And Base Paneling, All Softly Rendered In A Feminine White Finish. 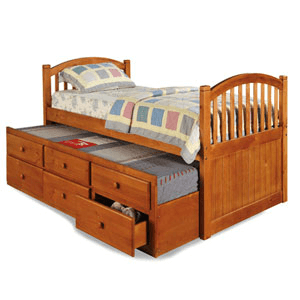 At The Bottom, The Included Trundle Unit Has The Look Of Six Drawers: Three Faux Drawer Front On Top And Three Actual Drawer Below, Each Outfitted With A Tonally Matched Wooden Knob And Spacious Enough For Extra Blankets And Clothes. When Slipped Out The Trundle Supports A Twin Mattress(NotIncluded). Strong Construction. Easy To Assemble.